YENDI, Ghana (AP) -- It was terrible enough that the beloved king was murdered and his head paraded on a spear, causing his 32 widows to cry at the mere mention of his name. Or that more than two years later, his headless body still languishes in a tiny hospital morgue. 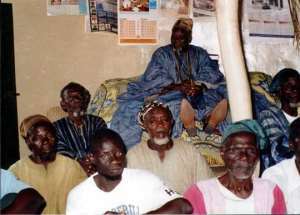 The brutal family feud that killed the King of Dagbon caused its share of havoc across the dust-blown fields of this northern Ghana kingdom. But family members say it's nothing compared to the violence threatening to erupt once the king is finally buried, in months to come -- launching a war of succession that's already looming. For centuries, the Abudu and Andani clans -- named after two sons of the ancient Dagbon king -- cordially rotated control of the kingdom, centered in Yendi, 530 kilometers (330 miles) north of Accra, the West African nation's capital. The 1,300-square kilometer (800-square mile) area of Dagbon is one of eight traditional kingdoms in Ghana, the largest with nearly 1 million people and dates back 600 years. A 30-year-old power struggle between the clans ignited in March 2002, when Abudu warriors dressed in battle regalia stormed the Andani palace and slaughtered the king, Ya-Na Yakubu, and 30 of his elders. The sacred Dagbon palace -- two dozen mud huts inside a walled compound -- was raked with bullets and burned to the ground. Andani elders say the king's body can be buried when a nearly rebuilt new palace is complete, with a pavilion for the slain ruler to lie in state. They will then name a successor -- most likely a son. But the Abudu contend that since the king is dead -- never mind how he died -- it's their turn to appoint his successor. That would likely be Mahamadu Abdulai, the 20-year-old Abudu chief from Yendi, who, residents say, was taken out of school and given three wives and a cadre of elders, who pamper him for majesty. One afternoon at the Abudu compound, the young chief sat sullenly in green shiny slippers and refused to speak, allowing one of his elders to explain the effect the feud could have on this otherwise peaceful country. "It is the Abudu's turn to take control of Dagbon," said Alhassan Iddrisu, who like his chief wore the traditional headwraps indicating a king has fallen. "Or there could be trouble." Kings and chiefs have autonomy over their areas, but many are finding it hard to keep the influence of modern politics at bay. Iddrisu explained that his clan has been bitter since 1974, when the now-late king took power after an Abudu king was ousted in disputed circumstances. Confidence runs high among the Abudu that the next reign will be theirs -- a hope bolstered, residents say, by the Abudu's magical juju power, still feared across West Africa. Outside the Abudu chief's chamber, a large stone lay covered in chicken blood and feathers. The young chief yawned from the afternoon heat and swatted at flies. "When the Ya-Na is chosen," Idrissu said, "drums will sound across the land." As it is, tensions over the regicide in the ancient kingdom are sending ripples across modern Ghana, a nearly half-century-old democracy trying to make its economic niche with high-tech call centers. A government commission charged with investigating the 2002 killings has achieved little more than to sow distrust. A tribunal charged with mediating the conflict hasn't fared much better. Government haplessness has led many Andani to suspect the killings were political, concocted by Abudu members of President John Kufuor's administration to give the clan the chieftaincy. Kufuor repeatedly denied any involvement. During the fighting, which lasted three days, palace phone lines and electricity were cut. The army never arrived, and the Yendi police stayed at their station, only a stone's throw from the sacked palace. In the heat of battle, the interior minister at the time -- an Abudu -- went on national radio to claim that Yendi was calm. The streets of Yendi remain tense today, with government troops stationed outside the two rival clan compounds with guns drawn. In Tamale, the regional capital, troops in armored personnel carriers patrol night and day. Their old palace destroyed, the late king's 32 wives live in a concrete compound off Yendi's main strip, where the fine red dust has painted every car and building. A dozen women were home one recent afternoon, cooking bright-red stews over charcoal and tending to the king's many children. "All we want is the government to find the perpetrators," said Fati Mopaga, the king's cousin, speaking for several widows seated in a front room. "Until that happens, we will stay here." The widows were still too distraught to talk, said Mopaga, yet one woman stood up, tears streaming down her face, and said, "The king was our light, and we loved him." Alhassan Andani, the late king's brother, said the new palace is almost complete. The two sides are still haggling over the final touches, however, since each clan believes it will be the palace's next occupants. Once the decoration is done, and the slain king buried, the two sides are expected to openly name their rival claimants to the throne. The uneasy inter-regnum truce will end, and any open struggle for succession will begin. "There will be two kings in Dagbon, and that can bring many lost lives, much worse than before," said Andani. Andani said he prayed for a peaceful solution, but added, "Everyone in Dagbon can be a warrior when the time comes."